Our recently refurbished one bedroom house is located in the beautiful rolling countryside of Suffolk. Situated between the fantastic medieval town of Bury St. Edmunds and the historic wool village of Lavenham; which boasts some of England's finest preserved listed buildings with a total of over 300 to see. A welcoming entrance hall with information table and doors to living/dining room, kitchen, bathroom and stairs rising to the double bedroom. 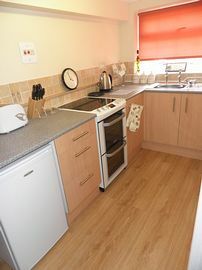 Our recently refurbished kitchen is complete with fridge, toaster, kettle, microwave and electric double oven. A modern fitted kitchen to suit all styles of cooking. The living/dining room is a triple aspect room giving plenty of natural light, with exposed beams and antique Welsh dresser. 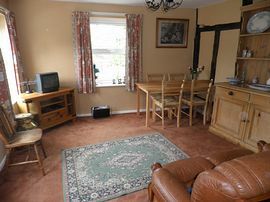 A dining table, remote control TV/DVD player and comfortable seating complete this relaxing room. A modern bathroom with toilet, bath and wash basin is also on the ground floor. 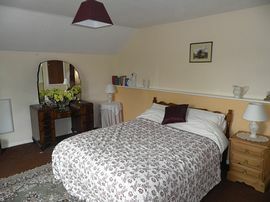 One the first floor is a large bedroom with a double bed, beautiful early twentieth century double wardrobes and dressing table and book shelf complete with plenty of bed time reading material. A lovely room to relax and plan the day ahead. Outside the property is a gravelled area with off road parking and a further area offering a comfortable bench to sit on and watch the world go by. Directly opposite the cottage is a grassed area for private use of our guests. 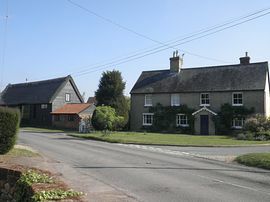 Cockfield itself is a vast village offering two public houses, village store, post office and a restaurant (within walking distance of the house). With wonderful field side walks it really is Suffolk countryside at it's best. A regular bus service from outside the property serves Bury St. Edmunds, Lavenham, Long Melford and further afield, you really can leave the car behind and explore. The Manger public house is approximately 1.5 miles from the house offering home cooked food 7 days a week, lunchtime and evenings. The Manger is a fantastic retreat to relax and enjoy superb food. As a note it is the only pub in the country called 'The Manger'. Born and bred in Suffolk we have the knowledge to create your dream trip to this amazing area. 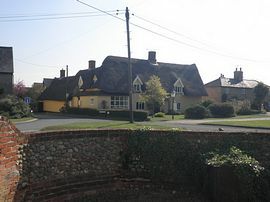 I lived in Cockfield for over 25 years and I grew up in the Georgian fronted house, Old Mill House, which adjoins One Old Mill Cottage. My family and I are passionate about this wonderful area, have in depth local knowledge and are here to help and advise you on the must see's in the area and to help you make the most of your time in this fantastic region. Here at Number One Old Mill Cottage we want to be as flexible as possible. We want to accommodate all that people ask, from a one night get away from the kids with a nice meal, or coming to visit relatives who don't have the space, or travellers exploring all glorious Suffolk has to offer. We will try and accomodate all requests and with competitive prices for this area; please call or email us to discuss your individual requirements. Close to Lavenham, Bury St Edmunds and Long Melford. Exposed beams in the living area. Smoking is permitted outside of the cottage and ashtrays are provided. A garden area is available with table and chairs. Local Services: A restaurnt is within walking distance of the cottage. Two pubs less than two miles away and further pubs and restaurants are a short drive away. A public bus stop is available from outside the property serving most local villages and towns. For 'SatNav' our postcode is IP30 0LG. We can offer full directions at the point of booking the cottage. Nearby railway stations are Bury St Edmunds, Stowmarket and Sudbury. Our prices are extremely competitive starting from just £50.00 per night inclusive of electricity and linen. Our full booking conditions will be sent by email or by post at the time of booking. We are able to offer accommodation throughout the year. Based on the 'Quality in Tourism' self catering guide the property is a 3 star accommodation.